Not too many people know that the planets in our solar system are classified into two categories: terrestrial planets and jovian planets. This article seeks to explain how the planets are divided into these two categories. Terrestrial planets are usually characterized by a central metallic core covered by a silicate mantle. Earth’s lone satellite, the Moon, has a similar but smaller iron core. Europa and Io, two of Jupiter’s many moons, are made up of internal structures similar to terrestrial planets. Depending on tectonic activities and the presence of water, canyons, mountains, volcanoes, craters, and other land structures can populate the surface of terrestrial planets. In addition, terrestrial planets have secondary atmospheres which are brought about by comet impacts and volcanic activity. Some planetary bodies outside our solar system, called exoplanets, have been found to be terrestrial, and the first ever confirmed terrestrial exoplanet is Kepler-10b, discovered by the Kepler Mission in 2011. In the same year, Kepler astronomers released a list of over 20 exoplanets that are likely to be terrestrial. Jovian planets are massive planets usually with a primary composition of gases or ice instead of solid matter such as rocks. There are four jovian planets in the solar system, and these are Jupiter, Saturn, Uranus, and Neptune. Currently, there are numerous exoplanets discovered to be orbiting other stars that may be made of gas or ice. Jovian planets are sometimes referred to as gas giants, although many astronomers reserve the term to Jupiter and Saturn, separating Neptune and Uranus as ice giants. However, both terms can be misleading as all jovian planets are composed of fluids above their critical phases. This is when distinct gas and liquid states no longer occur. Jupiter and Saturn are largely composed of helium and hydrogen, while methane and ammonia primarily make up Uranus and Neptune. 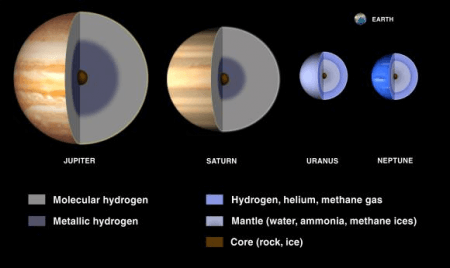 Jovian planets are theorized to have a dense molten core of rock elements. So what’s the difference between terrestrial and jovian planets? Their main difference is their composition. Terrestrial planets are covered with solid surfaces while jovian planets are characterized by gaseous surfaces. These terrestrial planets in our solar system are Mercury, Venus, Earth, and Mars. The jovian planets are Jupiter, Saturn, Uranus, and Neptune. It is theorized that terrestrial planets have a dense, metallic core (similar to that of Earth’s) that is surrounded by silicate materials. Jovian planets are massive planets with cores of lesser density. Their atmosphere can be composed of helium, hydrogen, methane, and ammonia. It is theorized that these planets have a core made of molten rock. Carbon dioxide and nitrogen are found in abundance in terrestrial planets. For more information about terrestrial and jovian planets, check out this YouTube video.